When I asked my nephew Dash what he wanted me to bake for his birthday he requested lamingtons. A lamington man, in fact. I thought about using a gingerbread man cookie cutter to cute the sponge cake before dipping it into chocolate icing and coconut. But that was too challenging and you will see down the post that I had another solution. This is my third go at making lamingtons on my blog. The first batch of lamingtons were good and a little pumpkiny and the cake was very sticky. Since then Sylvia has developed a pumpkin-aversion. The second batch of lamingtons was vegan and used some quince syrup. They were good but not the airy sponge cake of traditional lamingtons. This third batch was excellent with a light sponge cake and rich chocolate icing. The recipe came from Masterchef's Sophie Young. For the uninitiated, lamingtons are a traditional Australian cake that have long been popular for afternoon tea, cake stalls and fundraising drives. I grew up with them often in my mothers pantry and always at my grandmothers so they are a sentimental favourite (as I have written about previously). However they are also slightly challenging. Firstly there is the sponge cake which should be light and soft. Airy eggy baking is not my strength. Then there is all the faffy sifting and folding. Beware the flour bombs if you don't fold thoroughly and yet if you fold too vigourously you will beat out the air. The recipe I chose had no leavening but eggs. This made me a little nervous so I added some self raising flour. The sponge looked quite flat when out of the oven but had a really good texture. Next there is the messy business of dipping the cake into chocolate icing and coconut. The icing needs to be thin enough so that you can dip cake into it but thick enough that it will cling to the cake and not end up in a pool under the wire rack. There is no way to do this neatly. The kitchen gets covered in coconut. It is all worth it in the end. I was really pleased with these lamingtons. They were fluffy sponge with a rich chocolate icing that didn't drip much. I chose to go with the traditional dessicated coconut rather than the chunkier shredded coconut that Sophie Young used. 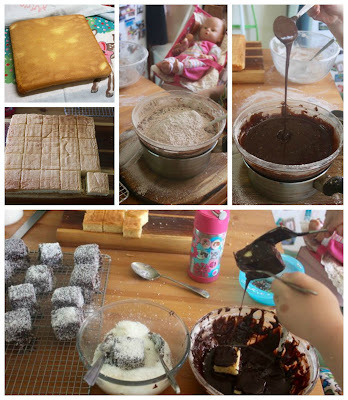 We made them on the morning of Dash's party so that the icing was still a bit damp which is the best way to eat lamingtons. When we got to my parent's house, Dash's parents, Chris and Fergal had arranged a fun party for him and his cousins. They really know how to organise an event! 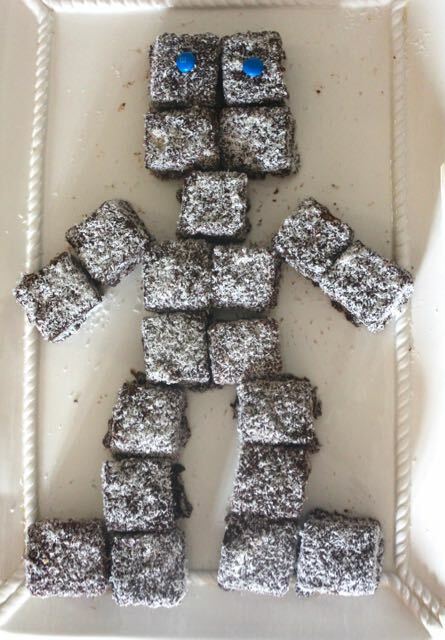 We arranged the lamingtons on a plate in the shape of a man. Sylvia chose some blue smarties for eyes. Dash has a book about the Lamington Man. It is an Australian version of the gingerbread man where he says "run, run as fast as you can, you can't catch me, I'm the lamington man". We had a great time at his party. Firstly there was pizza for lunch, followed by a swim at the local pool. Then we had sausage rolls, hot dogs, spring rolls and crisps. There was a break in party food while the kids went out to have a bash at the Darth Vader pinata. 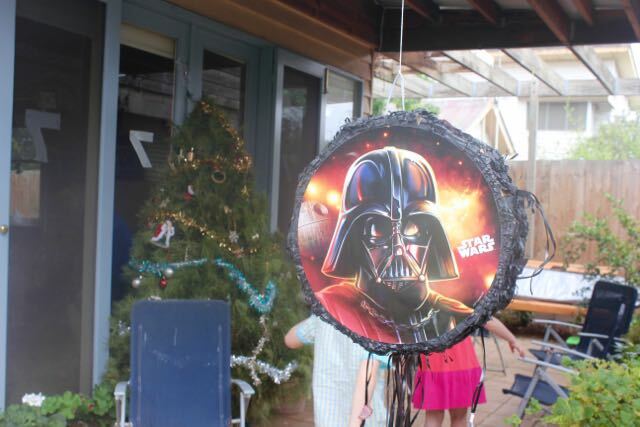 There was a Star Wars theme going on here with themed cups and party horns as well. But the food was all Aussie Aussie Aussie, Oi Oi Oi. Then back inside for more traditional Aussie party food: hedgehog, fairy bread, frog in the pond and lamingtons. Yes we were all well and truly stuffed. But we still had room for birthday cake. The funniest moment of the day was when my brother and his wife were sitting chatting to us when the kids had eaten their full and gone outside to play. Andy stood up in disgust and said "we are the frogs in the pond". 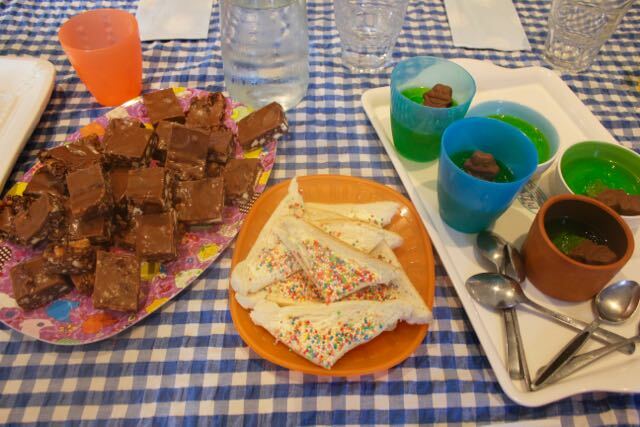 If you have never heard of frog in a pond, it is jelly with a chocolate freddo frog in it. Andy and Erica had been standing where one of the kids had spilled jelly. It was a funny end to a fun day. I am sending these to Janie (and Karen) for Tea Time Treats, Mandy (and Kirsty) for Cook Blog Share, and Emily for Recipe of the Week. Preheat oven to 190 C. Grease and line a 22cm square cake tin. Measure flour and set aside. Melt margarine and vanilla together and set aside. Beat eggs and sugar for 4 minutes. They should be pale and creamy and about three times the original volume. Sift flour onto egg mixture until covered and fold in gently with one motion with a metal spoon. Continue doing this until all the flour is sifted. Drop a spoonful of egg and flour mixture into the margarine mixture and mix well. Now very gently fold the margarine mixture into the egg mixture until just combined. Pour batter into prepared cake tin and bake for 20-25 minutes. The sponge should be golden and spring back when you touch it in the middle. Turn onto a wire rack lined with a tea towel. Cool. Leave the sponge overnight (or place in freezer for 20 minutes to firm up). 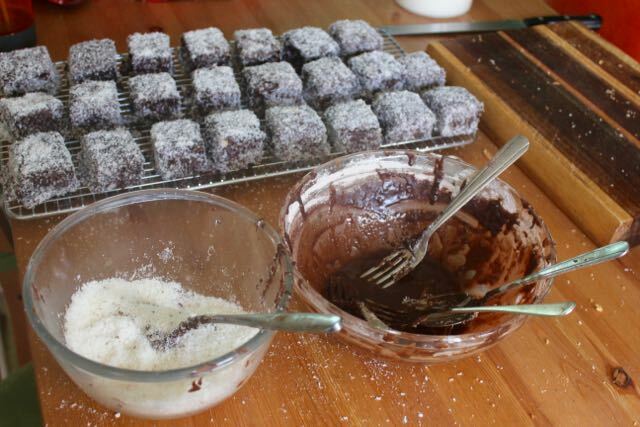 When you are ready to coat the lamingtons, make the chocolate icing. Choose a heatproof bowl that is about medium mixing bowl size but not too deep because you will be dipping into it. Stir the margarine and milk in this bowl over a gently simmering saucepan of water until the butter has melted. Turn off heat and remove bowl from the saucepan. Sift the icing sugar and cocoa together and mix into the milk mixture until you have a thin icing. Cut the sponge cake into 25 squares (ie five rows lengthways and widthways). Set up the bowl of chocolate icing with two forks and a spoon, a shallow bowl of the coconut with two forks and a large wire rack. Drop a square of cake into the chocolate icing and cover in icing, spooning icing over it if necessary. Pick up the square with two forks and hold above the bowl to let as much icing as possible drip back into the bowl. Drop the icing covered cake into the bowl of coconut. Use the forks with the coconut to toss the cake in coconut. Pick up the cake with the forks and place gently on the wire rack. As you can see in my list of equipment, I find it easiest to use different forks for the icing and coconut bowls. This recipe didn't drop much icing but will drip a little under the wire rack. The lamingtons can be kept in an airtight container. They are best on the day of making, great the next day and then after that start to diminish in texture. Your lammos look terrific and I adore the robot. Thanks Cakelaw - I can see that the lamington man would make a great robot! They look great Johanna. I like freshly baked ones-too many memories of ones that sit on shelves and that are really dry! 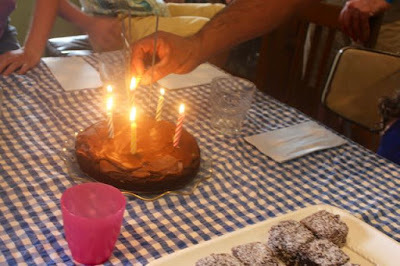 I think it's adorable that your nephew requested Lamingtons for his birthday. So cute and you did fabulous! I have never had the pleasure of indulging in any Lamingtons but I sure wouldn't mind at least once! I love the lamington man! And the lamingtons themselves look fantastic - just as they should do. I plan to make another vegan batch for Australia Day this year and you have got me looking forward to them already (if only they were a little less fiddly I am sure I'd make them very regularly as I do love them). 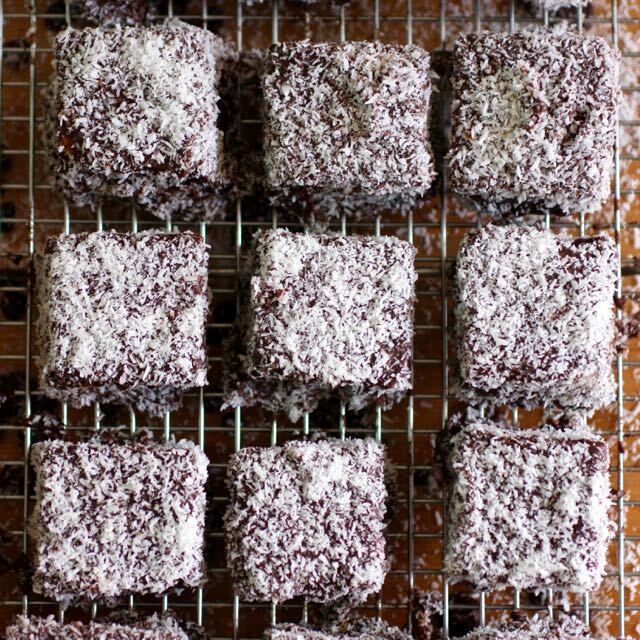 I've only made Lamington once in my life and that was when I lived in Glasgow and I loved them - so much nicer than those from the shops or cake shops that are dry, I don't understand why I don't make them often. Should give them a go some day. 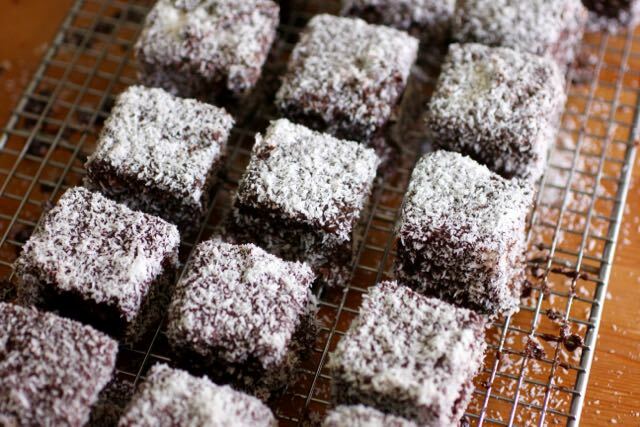 And the Lamington Man - clever idea! So much easier than using a cookie cutter. Thanks shaheen - glad you enjoyed them - sometimes the ones in the shops don't show you how wonderful they can be when fresh but I understand why you don't make them more - wish I did but they are so fiddly. They are fun to make with kids if you have the cake done. Sounds like a great birthday party for kids and adults alike! Looks delicious and sounds amazing....... very very messy though! Definitely one to plan when you have plenty of time to spare and have booked a cleaner to visit!